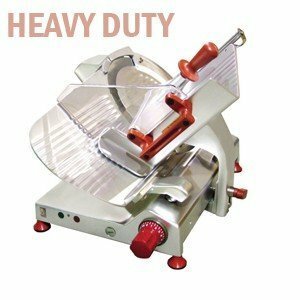 Learn everything you need to know about meat slicers and select the best meat slicer for your needs! 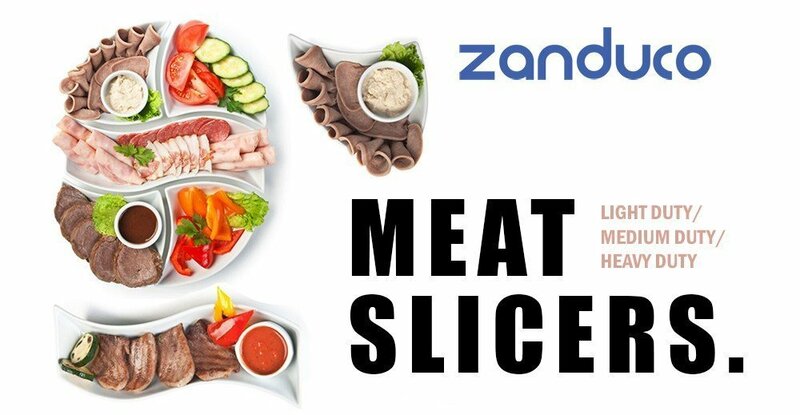 Whether your needs are light, medium or heavy duty, Zanduco has the slicer for you! to choose from – light duty, medium duty, and heavy duty. designed for simple operation and therefore not recommended for slicing cheese. 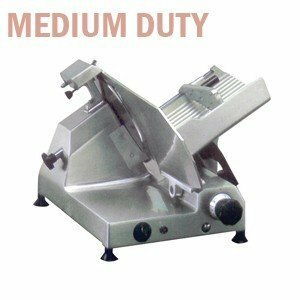 Light duty slicers are cheaper in price because they are smaller, and can only handle a light usage. production and precision of slices. constant use, and can slice cheese easily. Belt Driven vs Gear driven: Most slicers are belt driven. Gear driven blades would be more durable, however the cost to repair a gear driven slicer would be very costly. Blade Size: The most common blade size is a 12” blade. 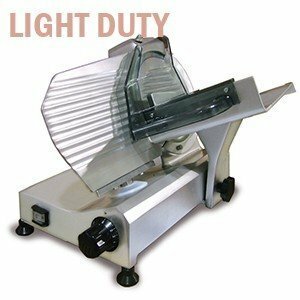 Light use slicers are recommended to be around 9”- 10”. Larger cutting blades (12” - 14”) are favorable for more extensive usage. Cleaning Leg: Some slicers are equipped with a cleaning leg that allows the user to prop up the deli meat slicer to clean underneath it. Horsepower: The higher the horsepower, the more frequent the use. types would be to determine how much slicing is done. Large delis and supermarkets would benefit the most from an automatic slicer.because they can slice continuously without constant assistance. supermarkets would benefit the most from an automatic slicer. a larger than average product tray size. Food slicers should be sanitized on a regular daily basis! Proper training is essential for any employee who operates the slicer. Knife Guard: All slicers expose as little of the blade as possible to prevent cut hazards. On some slicers you can remove it to clean the knife. No volt release: This safety feature requires the user of the slicer to push the power button to restart the slicer after it has been unplugged for cleaning, or if the power was interrupted. Gauge Plate Interlock: This feature requires the gauge plate to be set at “zero” to be able to tilt or remove the product tray/carriage for cleaning. Blade: The blade is generally permanently attached to the slicer. On some high-end models, the blade is detached with a special tool for a more thorough clean. Blade Guard: The blade guard protects the slicer. Most of the time the blade guard is removable for cleaning purposes. Pusher: The pusher holds the product that you’re slicing down. Sometimes it’s called the “meat grip”. Sharpener: Most models have a built in sharpener to keep the blade nice and razor sharp.